Eddie Jones’ Dead Man’s Hand is a book that brings back the forgotten, but still beloved, Wild, Wild West. 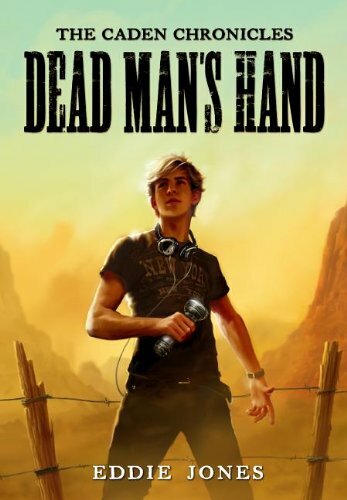 Fourteen year old Nick Caden travels with his bickering parents and bothersome younger sister to Deadwood Canyon Ghost Town, a vacation that, needless to say, wasn’t his first choice. With no cell reception and no internet access, Nick is forced to wonder around the dusty town looking for ways to entertain himself. While exploring, Nick happens upon a cowboy shot dead and only witnesses the tail end of the shooter as they run out the door. Using his cyber-sleuthing talents, Nick investigates the murder, meeting the quirky and peculiar actors that make the western characters (and happenings) of Deadwood appear real to guests. Although Dead Man’s Hand takes readers on a wild ride, it failed to live up to its potential. The main concern being the characters’ lack to respond emotionally to the events. Nick and his new (and also fourteen year old) friend, Annie, are witnesses to shootings, dead bodies, and other distressing acts. But neither seems to be fazed by any of it; they both retain a calm nature for almost the entire book. Questions also arise as to Nick’s ability to perform the tasks he does at his young age. Being fourteen, it seems almost impossible that his hobby is solving real life murders before the actual investigators do. It is not doubted the teens these days are skilled with computers, but it is quite hard to believe that Nick understands and uses the programs and formulas he does at such a tender age. With all that he is dealing with, the book would be more relatable, if not believable, if Nick was perhaps a few years older. Dead Man’s Hand, as many first books in a series do, has rough edges that could have been taken care of in another round or two of editing. Regardless of its faults, the book could be recommended, with parental guidance, for children who range from ages eight-eleven. Dead Man’s Hand is a typical adventure story, that young boys would have no problem tearing through. It’s not a thrilling, edge of your seat read for tweens and teens, but hope is still on the horizon for the sequel. I loved this piece, its incredibly moving and creative!